The event will feature never before seen excerpts from the greatest treasure trove of folk and roots music. March 21, 2016 - Sag Harbor, NY - Bay Street Theater & Sag Harbor Center for the Arts is pleased to announce Newport Folk Festival, A Retrospective, film screening on Friday, April 8 at 8 pm. Tickets are $15 and available online or by calling the Bay Street Theater Box Office at 631-725-9500, open Tuesday through Saturday 11 am to 5 pm. 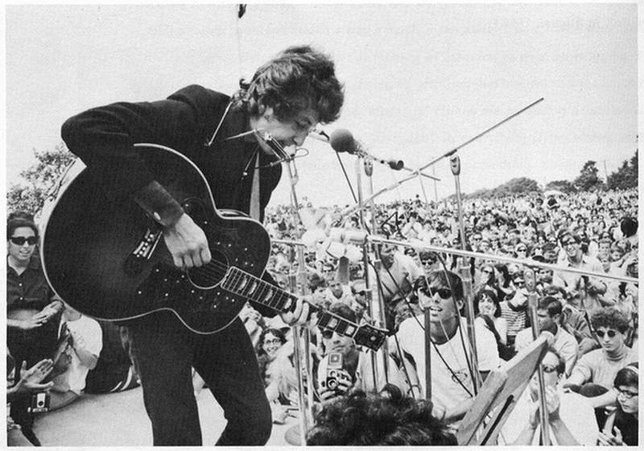 From 1963-1965, Academy Award-winning director Murray Lerner filmed the Newport Folk Festival featuring the then current folk scene featuring Joan Baez, Bob Dylan, Peter Paul and Mary to the original roots artists like Mississippi John Hurt, Johnny Cash, the Staple singers, and many more. Join us for a special evening curated by Mr. Lerner and hosted by Joe Lauro. Featuring never before seen excerpts from the greatest treasure trove of folk and roots music, it is a cinematic synthesis of four Newport Folk Festivals in which the art of folk music is pictured during its most crucial years. Join us for this one of a kind evening of film and discussion. Tickets are $15 and available online at baystreet.org, or by calling the Bay Street Theater Box Office at 631-725-9500. The Box Office is open Tuesday through Saturday 11 am to 5 pm. The Music Series is sponsored by Dan's Papers and WEHM 92.9/96.9. Subject: LongIsland.com - Your Name sent you Article details of "Bay Street Theater Announces Newport Folk Festival: A Retrospective Film Screening"